When AMD unveiled the ThreadRipper X399 platform back in July it caused huge shockwaves since this was an HEDT platform with absolutely no artificial limitations, superior capabilities, and an attractive processor lineup that was much cheaper than the competition’s. When we finally got our hands on this new platform it was clear to us that AMD had successfully delivered a product that would satisfy the needs of the most demanding power users. Now that the ThreadRipper platform has been available for a few months and has matured a bit we thought it was the perfect time to start testing out some X399 motherboards. Since the first AM4 motherboard that we reviewed was the ASRock X370 Taichi – and it was pretty much perfect from the get-go – we thought we would tap ASRock again and try out their flagship $660 CAD / $440 USD Fatal1ty X399 Professional Gaming motherboard. While “Professional” and “Gaming” don’t intuitively go together, the end result is nevertheless a motherboard that looks fantastic on paper. Former overclocking world champion and current ASRock employee Nick Shih has been pouring his time into the X299 platform to deliver optimal results from an ASRock motherboard, and the firm’s latest OC Formula is the result. Onboard RGB lighting is limited to the PCH sink and two cable outputs, just to please those who still want to light up their case. Resource shares are limited to the placement of SATA M.2 modules that steal SATA ports, since hardly anyone would limit their M.2 slot to SATA anyway. The motherboard that we are going to be reviewing today is the MSI B350 Tomahawk, which happens to be one of the most popular B350 models at the moment. With a retail price of $110 USD / $145 CAD, it certainly meets our definition of an affordable motherboard. When it comes to specs, it comes pretty well appointed. It has a six-phase CPU power design – which is average for B350 motherboards – along with one PCI-E x3.0 X16 slot, one PCI-E x16 slot that operates at PCI-E 2.0 x4, two PCI-E 2.0 x1 slots, and two legacy PCI slots. Connectivity wise, there are four SATA 6Gb/s ports, one full-speed M.2 x4 slot, eight USB 3.1 Gen1/USB 3.0 ports (four rear I/O, four via headers), and six USB 2.0 ports (two rear I/O, four via headers). Overall, this motherboard looks quite promising. As long as the UEFI BIOS and included software utilities aren’t troublesome, and it can achieve our baseline Ryzen 7 overclock, the MSI B350 Tomahawk is going to be an easy recommendation. Now it’s time to see if everything has indeed been well implemented. After noticing a few empty solder pads on ASRock’s value-awarded X299 Taichi, we said that we couldn’t wait to see the more advanced motherboard that will be based upon the same circuit board. We didn’t need to wait long. The high-end version was already in queue by the time the first review published. The Fatal1ty X299 Professional Gaming i9 adds an AQtion AQC107 10GbE controller from Aquantia, a front-panel USB 3.1 10 Gb/s header, a second ASM3142 USB 3.1 controller to support the added front-panel header, onboard power and reset buttons, and Creative’s Sound Blaster Cinema 3 audio software. It also loses the cheaper board’s DTS Connect license, since compatible receivers are generally thought of as being home-theater equipment. This is, after all, a “Professional Gaming” motherboard. In this review we take a look at the ASRock X399 Taichi. This stylish AMD Ryzen Threadripper motherboard is available for 349 USD / 369 Euros and might be an attractive offer for the sheer amount of sweetness you receive in return. In this motherboard you will spot three locations for M2 SSDs combined with audio based upon a Realtek ALC 1220 and TI NE5532 Premium Headset Amplifier. ASRock is embedding a 2 x GigaLAN Intel I211AT into the board and sure, a bit of RGB LEDs as well (albeit very subtle). The CPU can be powered by 8+4 pin power connectors. The board has four PCI-Express x16 slots and an array of OC buttons as well as a diagnostic POST LED. Since X399 will bring support of up-to 64 PCIe Gen3 lanes bringing anything and everything multi-GPU support multi-GPU into play, including full-on quad GPU support, the spacing on the mobo does support it. Unfortunately ASRock did not implement any Aquantia AQC-107 LAN chip can be spotted, a bit of a miss for such a high-end product, you do get 802.11 a/b/g/n/ac + BT4.2 Wireless Ethernet, however a rather poor implementation of it, we’ll show you that in the review. You’ll spot a nice design familiar to that Tachi design. The X399 board is among the cheaper ones available listed at € 369,- / 349 USD. We review the a premium X299 motherboard, the MSI X299 Gaming M7 ACK. A nice motherboard in dark accents that is loaded with features and design. It comes with very proper AC wifi, is all shielded and expands design and features. This X299 motherboard can house Kaby-Lake-X and Skylake-X processors. It is time for our second X299 review, this turn goes to the X299 Prime Deluxe from ASUS. A totally fab looking motherboard in black and white accents with a small embedded LCD display. It’s not just about the looks though as the X299 motherboard can house Kaby-Lake-X and Skylake-X processors, but also is injected with a lot of extra features. The AMD Ryzen processor has been out for four months now, and there have been many updates to make things run a little smoother. While many were very upset at the launch issues, we should all acknowledge that these type of issues happen whenever there is a major architecture change; we just tend to forget about them over time. The issues at launch included gaming performance, power usage and memory incompatibility. After the first big update that was to fix gaming performance, we took a look at the AMD Ryzen 1700X and checked how it performed against the Intel i7-7700k in a 14 Game Showdown. We found that Ryzen had indeed stepped up and looked to perform much better than at release in a gaming environment. Gigabyte has been working hard with AMD to resolve the memory incompatibility issues, when we originally tested the Ryzen 1700X our test kit, HyperX Predator 3200MHz, was only able to run at 2933MHz with manual settings. 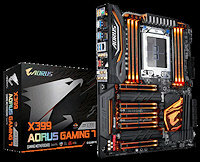 Gigabyte Aorus says they have resolved the memory issues, so we are going to give it another shot and take a closer look at the Gigabyte Aorus AX370-Gaming 5 motherboard which can be purchased online for $189.99 with free shipping. 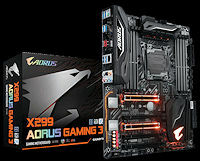 In our first Intel X299 motherboard review we take a look at what GIGABYTE has to offer in the X299 AORUS Gaming 3 – which offers Skylake-X and Kaby Lake-X processors a catalogue of enthusiast-grade features.